What we are basically doing here is creating swatches. Professionals like fashion and interior designers, illustrators and painters use swathes and pallets to create mood, create a harmony of color, and to do this correctly they start by making a visual inventory of paint they have (simply laying out the colors on one sheet of paper). Line out 3 x 4 cm rectangles. I made 24 sections since I’ve got a set of 24 pencils. Color in each section changing the pressure on each pencil from light at the start to strong at the end. 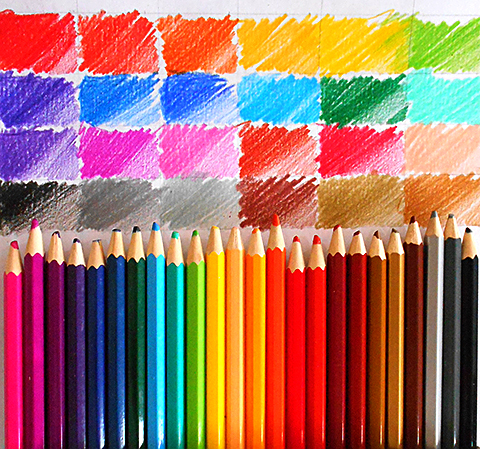 This way you will find out the real colors of your pencils, because the pencil wrap is often different from its true lead color. Also, you will notice how the depth of color changes depending on the pressure you apply. And of course you will choose your favorite colors and their combinations.